Mother Nature, Greenpeace and the National Geographic Magazine believe that killer whales (lead image, left) are predators of the sea who have been misnamed. They are dolphins who kill whales (also seals, sea lions, sharks, and occasionally, when they get upset, a zoo-keeper). In Chelyabinsk, environment investigators and city residents believe that the Mechel steel, coke and coal company is a predator which kills people with air and waterborne pollution. 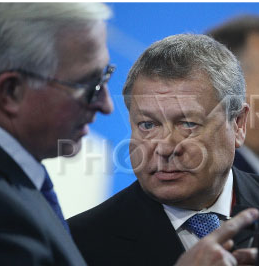 The control shareholder of Mechel, Igor Zyuzin (lead image, right) employs people. 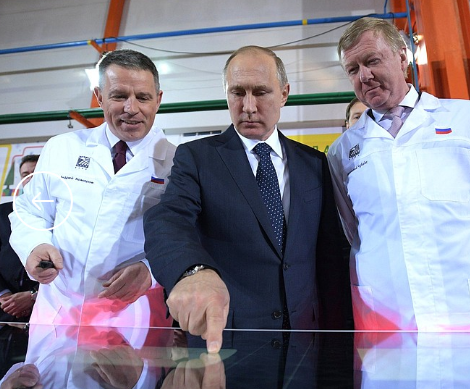 He employs Alexander Shokhin (centre) to use his influence with the Kremlin and officials of the federal and regional governments to guard Mechel and make sure it isn’t stopped doing what it does. Mechel ought to say what that is, according to the rules of the United States Securities and Exchange Commission (SEC) as a public shareholding company listed on the New York Stock Exchange (NYSE). Except that as a Russian company, Rule 405, Rule 3b-4, and Rule 12g3-2(b) exempt “foreign private issuers” from the same standards of disclosure as apply to US resident companies. This doesn’t mean the SEC allows Mechel to get away with, er murder; it is obliged to comply with Russian laws against that. But if it is operating illegally on Russian territory, its reports to the SEC and NYSE don’t have to say so. Accordingly, when Shokhin is telephoned and emailed at his office in Moscow, he knows the American rules don’t oblige him to answer any question about his job at Mechel, including how much the company pays him as Zyuzin’s deputy on the board of directors. Shokhin is diving deep under the surface where he can’t be seen -– and the American rules make it legal for him to do it. 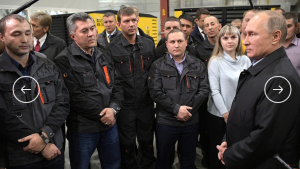 The cure for Mechel’s poisoning of Chelyabinsk which Shokhin has persuaded his friends in government to allow is simple – Mechel pays the government a small amount of money for its poisons, tax deductible. ZNAK (Russian for sign) is an Urals-based internet publication which documents often and in detail the pollution of air, water and earth by the industrial plants of the region, and the lethal impact this is having on the health of the population. The particular problems of Chelyabinsk can be also followed in this archive. Igor Zyuzin, owner of Mechel; read the story here. Putin also put his finger on the point. Since Putin left Chelyabinsk, ZNAK reported the opening of a criminal case against violators of the air emission rules. That was in February 2017, but no specific targets were named. In June, four months later, the prosecutors opened a second criminal case after Rospotrebnadzor (Russian Federal Service for Surveillance on Consumer Rights Protection and Human Wellbeing), the environmental health regulator, reported measurable pollutants in the city air at more than 40 times the permitted levels. According to the prosecutors, Mechel’s plant converting coal into coke for the steel smelters, Mechel Coke, should lose its permit to exceed emission levels. At the time, Mechel Coke was paying about Rb100,000 ($1,700) in separate violation fines, for a total estimated annually of Rb7 million ($121,000). The regional office of Rosprirodnadzor (Federal Service for Supervision of Natural Resources) cancelled Mechel Coke’s emission permits. That ought to have shut the plant down, but Mechel appealed, and the shutdown was delayed by the court proceedings. Mechel Coke and Mechel’s nearby steel smelters at the Chelyabinsk Metallurgical Plant have continued to produce air emissions well above the permitted limits. At the start of this month, the city was blanketed by summer smog. Mechel mines both coal for steelmaking and export, and produces several types of steel. Listed on the New York Stock Exchange in 2003, it is controlled through offshore entities by Igor Zyuzin. For his record, click to open the archive. Zyuzin is one of the regulars at Putin’s annual Christmas dinners for the oligarchs. After years of lossmaking and debts which have brought the company under the control of the state banks, Mechel began to show modest profits in 2016 and 2017. 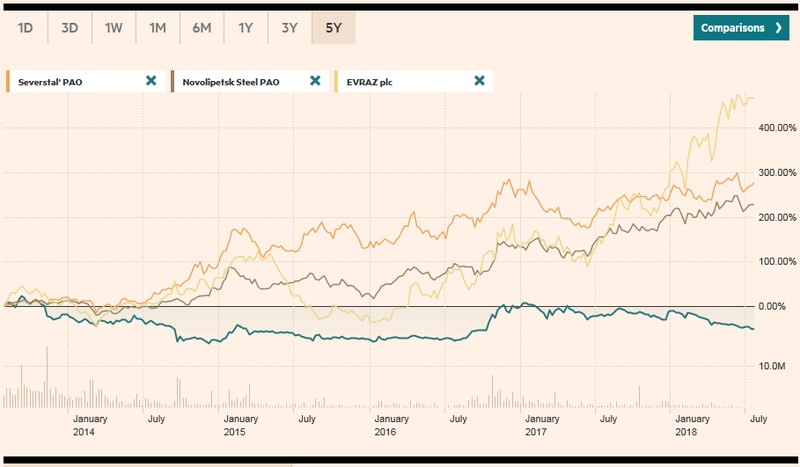 Compared to other publicly listed, oligarch-owned Russian steel and coal combines, Mechel has performed worst of all. 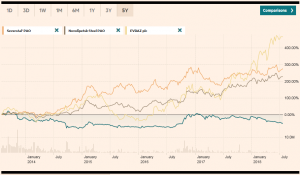 The latest Mechel presentation to investors of July 2017 claims Zyuzin controls the company through family ownership of 50.1% of the ordinary shares, with a free float of 49.9%. It sells most of its steel to Russian buyers; most of its coal to China and other Asian buyers. The presentation doesn’t touch on the company’s environmental record; there is no mention of the risks and costs of litigation, nor the capital required for the remedy Putin claims will be implemented from next year. The company reports also acknowledge that Mechel pays for insurance to cover environmental liabilities, although Mechel is such a chronic polluter in Chelyabinsk, and the winter and summer smogs such regular occurrences, it isn’t clear what cover the insurance policy provides. Buried on page 116 of the report is the admission that Mechel pays to pollute. “The Environmental Protection Law and other Russian environmental protection legislation establish a ‘pay-to-pollute’ regime administered by federal and local authorities. Pay-to-pollute (or payments for environmental pollution) is a form of mandatory reimbursement to the Russian government for damage caused to the environment.” According to the report, “in 2017, we incurred above-limit fees and penalties in Russia in the amount of approximately 67.8 million rubles.” That was equivalent to $1.2 million. The sum represents about 4% of Mechel’s reported cost of sales for the year. The corresponding pay-to-pollute outlays for the previous years were “approximately $5.0 million” in 2014; in 2015 “approximately Rb94.9 million” [$1.3 million]; in 2016, Rb61.9 million [$1.02 million]. In other words, in dollar-exchange constant terms, Mechel is now paying five times less than it did in 2014 for the pay-to-pollute charge. No estimate or audited figure for the company’s capital spending on pollution controls has been reported. The last report of the company’s capital expenditures refers to the construction of the Elga coalmine in Yakutia, railroad building, and regular plant and mine maintenance. The company claims: “we estimated the total amount of capital investments to address environmental concerns at our various subsidiaries at RUB 598 million [$10.3 million] as of December 31, 2017.” It was purportedly Rb647 million [$10.6 million] the year before. It is impossible to tell what exactly this money was spent on, if anything. Pay-to-pollute is an operating charge. Fines for pollution permit violations, which have been imposed by the regional authorities and courts, are an extra cost. The financial statements do not identify how much the company pays in pollution fines. Fines are identified, but these relate to Zyuzin’s indebtedness and Mechel’s defaults in repayments to its banks. The word pollution does not appear in any Mechel financial report. In 2012, when Mechel was issuing its financials in US dollars, it identified fines related to income tax at $6 million in 2012, rising to almost $13 million in 2014, as well as $21.4 million in fines for non-income tax violations. After 2014, this category of disclosure was hidden away. The year 2014 also appears to have been the peak for the pollution and other fines the company admits to paying. As listed in the category of “general administrative and other operating expenses”, the item “fines and penalties” cost the company $21.5 million in 2014; in 2013, $17.6 million; 2012, $10 million. Pollution is not only a minuscule cost in Mechel’s balance-sheet. That cost is also the relief from criminal liability for Zyuzin and the man he counts on to arrange his government relations, deputy chairman Alexander Shokhin (with Zyuzin, right). Shokhin, 66, started his professional career as an economist in the Soviet Foreign Ministry; he then joined the cabinet of Yegor Gaidar’s and Victor Chernomyrdin’s governments under Boris Yeltsin. A loyal apparatchik, who accepted subordination, Shokhin has been the head of the business lobby, the Russian Union of Industrialists and Entrepreneurs (RUIE), since 2005. 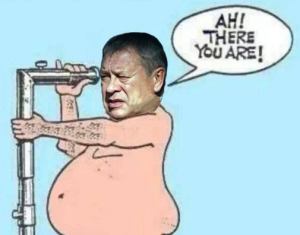 Mikhail Fridman hired him as a director for TNK-BP, as did the Finnish energy concern, Fortum. At the same time he was on the LUKoil board for its owner, Vagit Alekperov. Other Russian company boards employing Shokhin have included Baltika Breweries, Alrosa, Russian Railways, Renaissance Capital, Eurasia Drilling, and TMK, the steel pipemaker. Zyuzin appointed him to the Mechel board in mid-2016; he is not listed as an independent. Mechel’s investment relations and press offices do not answer questions about the company’s pollution record in Chelyabinsk, nor the financial details of its spending “to address environmental concerns at our various subsidiaries.” The company refuses to report to the NYSE how much it pays Shokhin to serve on the board of directors. Shokhin did not respond to telephone calls and emails at his RUIE office in Moscow. He refuses to say when he began on the Mechel board, if he regards himself as an independent on the board, and what compensation he receives from the company.